The movie is titled Zero-Point: the Story of Mark McCandlish and the Flux Liner. McCandlish and his research is the main source for the information in the documentary. McCandlish is an aerospace illustrator who began researching antigravity in 1988 when a friend described to him a secret advanced anti-gravity vehicle he had seen at Norton Air Force Base. The story goes, McCandlish and a friend were planning on attending an air show at Norton Air Force Base, but McCandlish had to cancel due to a last minute illustration needed by Popular Mechanics. His friend did go, and through a well connected acquaintance was able to gain entrance to a secured area of the base with a special display for politicians and military personnel with high level security clearances. McCandlish’s friend told him that in this display were three flying saucers floating above the ground. They made no sound. One of them had the side panels removed so that people could view the inner workings. There was also a monitor showing a video of the craft being test-flown. They made “hopping” maneuvers, and then could shoot straight up at incredible speeds. All while making no sound. 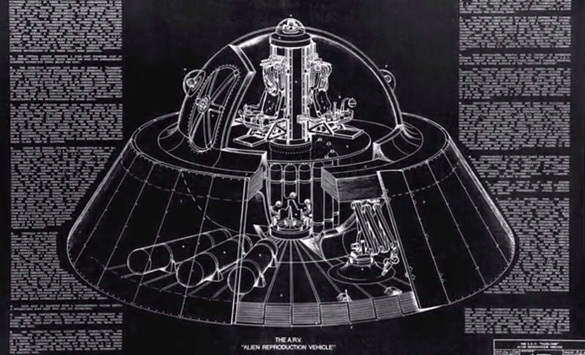 The craft were referred to as Alien Reproduction Vehicles (ARVs), and also had the nickname, “Flux Liner.” McCandlish says he believes these craft are part of a secret program that has been around for decades. Using his friend’s description, McCandlish sketched the vehicle, and he has since done research on how he believes the technology works. He says they use zero-point energy, a concept originally theorized by Albert Einstein. New theory: A UFO destroyed China’s moon rover?